Married Name 28 April 1923 As of 28 April 1923,her married name was Janitski. Married Name 28 April 1923 As of 28 April 1923,her married name was Janetske. 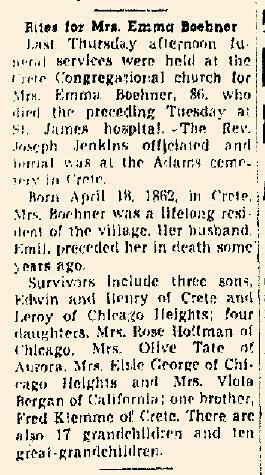 Edna Leona Klemme was born on 29 May 1901 at Crete, Will, Illinois. Edna Leona Klemme married August Joseph Janetske on 28 April 1923 at St. Liborius Church, Steger, Will, Illinois, Receiption for Mr and Mrs Gus Janitzki held 06 May 1923. Edna Leona Klemme witnessed the burial of Margaret Erickson in May 1948 at Illinois; Mr and Mrs Walter Klemme and daughter Joan, Mrs Leslie Adams, Mrs Dee M Sumpter, Mrs Gus Janetske and Mrs A C Hartmann attended funeral services for Margaret Erickson at the West End funeral chapel, Chicago Heights, last Wednesday afternoon. Miss Erickson, who died suddenly May 9 at her home in Chicago was a sister of Mrs Klemme and was a former resident of Chicago Heights. 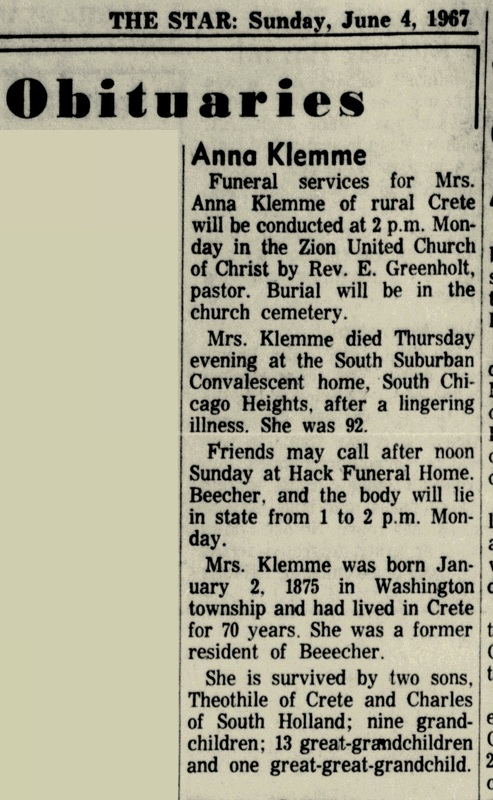 Edna Leona Klemme witnessed the burial of Heinrich Wilhelm Klemme in January 1953 at Saint Luke Cemetery, Beecher, Will, Illinois. 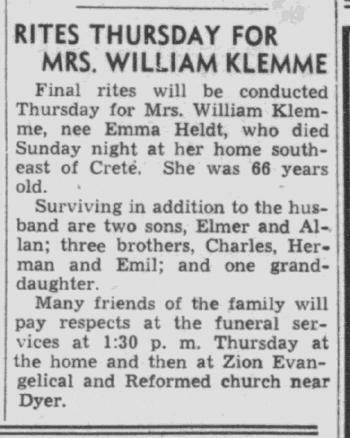 Edna Leona Klemme witnessed the burial of Henry E. Klemme in January 1953 at Zion Evangelical and Reformed Church, Hanover Prairie, Dyer, Indiana; Henry Klemme funeral notice. Edna Leona Klemme died on 27 November 1970 at Chicago Heights, Cook, Illinois, at age 69. She was buried after 27 November 1970 at Skyline Memorial Park, Monee, Will, Illinois. 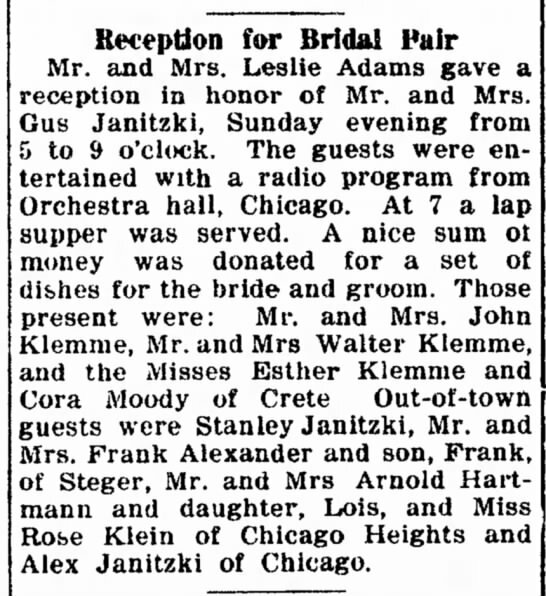 On 12 October 1961 at Crete, Will, Illinois, Leslie and Ida (Klemme) Adams 50th wedding anniversary celebration. On 28 April 1963 at Crete, Will, Illinois, attended Gus and Edna (Klemme) Janetske 40th wedding anniversary surprise party. [S250] U.S. Federal Census 1930 U.S. Federal Census, by Ancestry.com, ED99-2. Dwelling 222. Name Variation August Joseph Janetske was also known as Janitski. Name Variation August Joseph Janetske was also known as Janetski. Name Variation August Joseph Janetske was also known as Gus. August Joseph Janetske was born on 25 December 1899 at Steger, Will, Illinois. 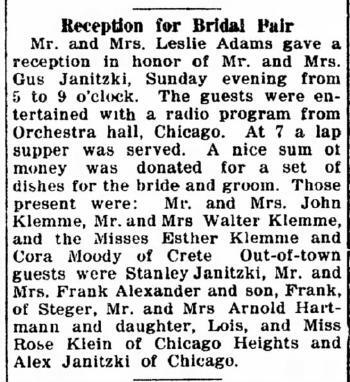 He married Edna Leona Klemme, daughter of John Charles Klemme and Ella Sarah Corwin, on 28 April 1923 at St. Liborius Church, Steger, Will, Illinois, Receiption for Mr and Mrs Gus Janitzki held 06 May 1923. August Joseph Janetske witnessed the burial of Henry E. Klemme in January 1953 at Zion Evangelical and Reformed Church, Hanover Prairie, Dyer, Indiana; Henry Klemme funeral notice. August Joseph Janetske died on 13 June 1973 at age 73. He was buried after 13 June 1973 at Skyline Cemetery, Monee, Will, Illinois. August Joseph Janetske obtained US Social Security Card at Illinois; Last residence Crete, Will, Illinois. On 28 April 1963 at Crete, Will, Illinois, attended Gus and Edna (Klemme) Janetske 40th wedding anniversary surprise party. Name Variation Elise Katharina Alwine Klemme was also known as Else. Elise Katharina Alwine Klemme was born on 12 April 1862. She was the daughter of August Chris Klemme and Christina Grages. [S193] Church Record, Zion United Lake Co IN Extract, Pg 68. No 8. [S193] Church Record, Zion United Lake Co IN Extract, Pg 33. Name Variation Maria Katharine Elise Klemme was also known as Matilda. Name Variation Maria Katharine Elise Klemme was also known as Mathildi. Married Name 19 December 1889 As of 19 December 1889,her married name was Ohlendorf. Maria Katharine Elise Klemme was born on 8 August 1867 at Crete, Will, Illinois. She was the daughter of Heinrich Christian Klemme Jr. and Maria Dorothea Sophia Grages. Maria Katharine Elise Klemme was buried in 1927 at Zion United Church of Christ Cemetery, Dyer, Lake, Indiana. She died in 1927 at Crete, Will, Illinois. [S193] Church Record, Zion United Lake Co IN Extract, Baptism pg 234. No 28. [S193] Church Record, Zion United Lake Co IN Extract, page 91. [S245] U.S. Federal Census 1900 U.S. Federal Census, by Ancestry.com, ED101. Dwelling 234.Year: 1900; Census Place: Crete, Will, Illinois; Roll: T623_353 Page: 13B; Enumeration District: 101. [S244] U.S. Federal Census 1910 U.S. Federal Census, by Ancestry.com, ED143. Dwelling 22. [S243] U.S. Federal Census 1920 U.S. Federal Census, by Ancestry.com, ED145. Dwelling 91. Name Variation Charlotta Karolina Klemme was also known as Carolina. Name Variation Charlotta Karolina Klemme was also known as Lena. Married Name 6 December 1896 As of 6 December 1896,her married name was Heldt. Charlotta Karolina Klemme was born on 21 March 1873 at Illinois. She was buried on 16 October 1931 at Washington, Will, Illinois. [S193] Church Record, Zion United Lake Co IN Extract, Baptism pg 361. No 43. [S186] Illinois, Illinois Statewide Marriage Index, license 17196. [S245] U.S. Federal Census 1900 U.S. Federal Census, by Ancestry.com, Sheet 10B. Dwelling 187. ED147. [S243] U.S. Federal Census 1920 U.S. Federal Census, by Ancestry.com, ED207. Dwelling 83. [S250] U.S. Federal Census 1930 U.S. Federal Census, by Ancestry.com, ED99-83. Dwelling 87. Sheet 3B. Name Variation Wilhelm Klemme was also known as William. Wilhelm Klemme died on 23 April 1944 at age 77. He was buried after 23 April 1944 at Zion United Church of Christ Cemetery, Dyer, Lake, Indiana. Wilhelm Klemme was confirmed in 1881 at Zion United Church of Christ, Hanover, Lake, Indiana.10 Before 1901 portrait of Henry and Katherine (Grages) Klemme family. In Katharina Grages's will dated 7 November 1903 at Will, Illinois, Wilhelm Klemme was named as executor. He lived in 1918 at Crete, Will, Illinois.11 On 12 July 1938 at Birthday celebration for Allen Klemme. [S193] Church Record, Zion United Lake Co IN Extract, Baptism pg 197. no 24. [S193] Church Record, Zion United Lake Co IN Extract, Place from Marriage record no 109. [S193] Church Record, Zion United Lake Co IN Extract, Marriages pg 109. [S244] U.S. Federal Census 1910 U.S. Federal Census, by Ancestry.com, ED134. Dwelling 34. [S243] U.S. Federal Census 1920 U.S. Federal Census, by Ancestry.com, ED145. Sheet 10B. Dwelling 213. [S250] U.S. Federal Census 1930 U.S. Federal Census, by Ancestry.com, ED99-4. Dwelling 101. [S193] Church Record, Zion United Lake Co IN Extract, Confirmation pg 258. Married Name 22 November 1896 As of 22 November 1896,her married name was Klemme. She was the daughter of Wilhelm Jochim Fredrich Carl Heldt and Johanna Sophie Caroline Staeth. 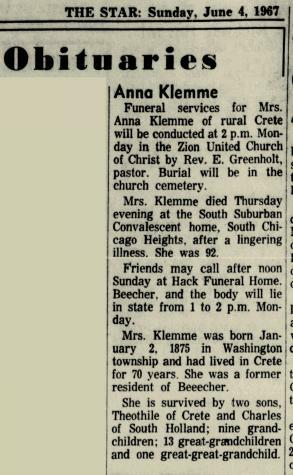 Emma Heldt lived with Wilhelm Klemme in 1918 at Crete, Will, Illinois.9 On 12 July 1938 at Birthday celebration for Allen Klemme. [S193] Church Record, Zion United Lake Co IN Extract, Spouse place = Washington, IL. [S238] Illinois Death Records, by Illinois, certificate 0000359. [S246] U.S. Federal Census 1880 U.S. Federal Census, by Ancestry.com, Year: 1880; Census Place: Washington, Will, Illinois; Roll: 261; Family History Film: 1254261; Page: 508A; Enumeration District: 214; Image: 0117. Name Variation Theodor Klemme was also known as Theodore. Theodor Klemme was born on 16 September 1879 at Will, Illinois. 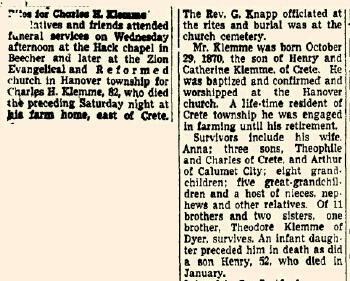 Theodor Klemme died on 23 October 1954 at age 75 Theodore Klemme obituary. He was buried after 23 October 1954 at Zion United Church of Christ Cemetery, Dyer, Lake, Indiana. Theodor Klemme was confirmed in 1894 at Zion United Church of Christ, Hanover, Lake, Indiana.8 Before 1901 portrait of Henry and Katherine (Grages) Klemme family. [S193] Church Record, Zion United Lake Co IN Extract, Baptism pg 484. no 63. [S322] Ohio, Ohio Marriages, 1803-1900, Book: M Original Source Page: 35. [S244] U.S. Federal Census 1910 U.S. Federal Census, by Ancestry.com, ED44. Dwelling 22. [S243] U.S. Federal Census 1920 U.S. Federal Census, by Ancestry.com, ED37. Dwelling 92. [S250] U.S. Federal Census 1930 U.S. Federal Census, by Ancestry.com, ED45-78. Dwelling 246. Nickname Dorothea Piepho also went by the name of Dores. Name Variation Dorothea Piepho was also known as Dorthea. Married Name 25 October 1906 As of 25 October 1906,her married name was Klemme. Dorothea Piepho was born on 6 August 1884 at Indiana also reported as Aug 1885. She was the daughter of Christoph Piepho and Anna Margaretha Elting. Dorothea Piepho died on 11 March 1962 at age 77. She was buried after 11 March 1962 at Zion United Church of Christ Cemetery, Dyer, Lake, Indiana. [S245] U.S. Federal Census 1900 U.S. Federal Census, by Ancestry.com, ED28. Dwelling 120. Name Variation Emil Karl Klemme was also known as Emil Carl. Emil Karl Klemme was born on 19 October 1874 at Illinois. He was buried after 1 August 1918 at Zion United Church of Christ Cemetery, Dyer, Lake, Indiana. Emil Karl Klemme was confirmed in 1889 at Zion United Church of Christ, Hanover, Lake, Indiana.6 Before 1901 portrait of Henry and Katherine (Grages) Klemme family. In Katharina Grages's will dated 7 November 1903 at Will, Illinois, Emil Karl Klemme was named as an heir. [S193] Church Record, Zion United Lake Co IN Extract, Baptism pg 383. no 46. [S238] Illinois Death Records, by Illinois, certificate 0024150. [S193] Church Record, Zion United Lake Co IN Extract, Confirmation pg 260. Name Variation Christoph Karl Klemme was also known as Carl. Name Variation Christoph Karl Klemme was also known as Charles H. Klemme Sr.
Christoph Karl Klemme was born on 30 October 1870 at Illinois. Christoph Karl Klemme died on 25 July 1953 at Dyer, Lake, Indiana, at age 82 Charles H Klemme obituary. He was buried after 25 July 1953 at Zion United Church of Christ Cemetery, Dyer, Lake, Indiana. [S193] Church Record, Zion United Lake Co IN Extract, Baptism pg 308. no 37. [S186] Illinois, Illinois Statewide Marriage Index, license 00015113. [S245] U.S. Federal Census 1900 U.S. Federal Census, by Ancestry.com, Dwelling 219. ED 101. [S250] U.S. Federal Census 1930 U.S. Federal Census, by Ancestry.com, ED99-4. Dwelling 100. Name Variation Maria Emilie Anna Claus was also known as Anna. Married Name 12 January 1893 As of 12 January 1893,her married name was Klemme. Maria Emilie Anna Claus was born on 2 January 1875 at Illinois. She was the daughter of Johann Freidrich August Claus and Anna Maria Ilsabein Wilke. Maria Emilie Anna Claus died on 1 June 1967 at Lake, Indiana, at age 92 Anna (Claus) Klemme obituary. Maria Emilie Anna Claus lived with Christoph Karl Klemme in 1918 at Crete, Will, Illinois.7 In January 1956 attended Mrs Charles H Klemme Sr (Maria Claus) birthday party. [S246] U.S. Federal Census 1880 U.S. Federal Census, by Ancestry.com, Year: 1880; Census Place: Washington, Will, Illinois; Roll: 261; Family History Film: 1254261; Page: 501C; Enumeration District: 214; Image: 0103. He was the son of Christoph Karl Klemme and Maria Emilie Anna Claus. Arthur Walter Klemme married Pearl Linda Claus circa 1915. 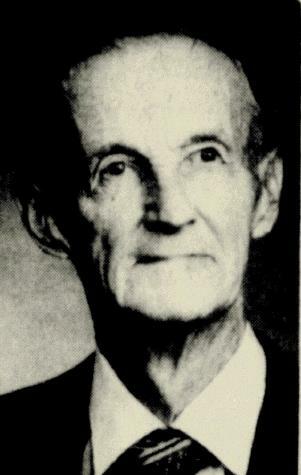 Arthur Walter Klemme died before 1967. [S193] Church Record, Zion United Lake Co IN Extract, Baptism pg 678. No 99. [S250] U.S. Federal Census 1930 U.S. Federal Census, by Ancestry.com, ED99-84. Sheet 7A. Dwelling 151. Name Variation Theophil Klemme was also known as Ted. Name Variation Theophil Klemme was also known as Theophile. Theophil Klemme married Lyla Oberloh on 24 September 1924 at Dyer, Indiana. 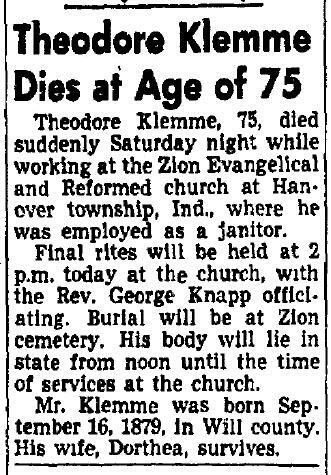 Theophil Klemme died in August 1975 at age 77. Theophil Klemme obtained US Social Security Card at Illinois; birth listed as 23 Mar 1898. Last residence: Crete, Will, IL.. He lived with Christoph Karl Klemme in 1918 at Crete, Will, Illinois.6 In January 1956 attended Mrs Charles H Klemme Sr (Maria Claus) birthday party. 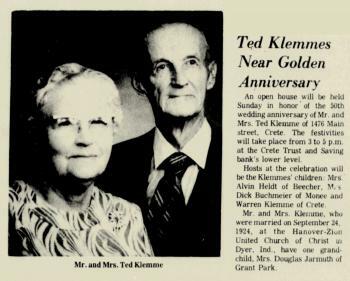 In September 1974 attended Ted and Lyla (Oberloh) Klemme 50th wedding anniversary celebration. [S193] Church Record, Zion United Lake Co IN Extract, Baptism pg 716. No 105. [S243] U.S. Federal Census 1920 U.S. Federal Census, by Ancestry.com, ED99-4. Dwelling 81. 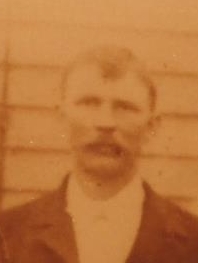 Name Variation Eduard William Klemme was also known as Edward Carl. Eduard William Klemme was born on 19 September 1868 at Crete (Endor), Will, Illinois. 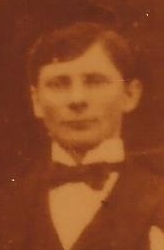 Eduard William Klemme died on 11 July 1927 at Dyer, Lake, Indiana, at age 58. He was buried after 11 July 1927 at Marengo City Cemetery, Marengo, McHenry, Illinois. Eduard William Klemme was confirmed in 1883 at Zion United Church of Christ, Hanover, Lake, Indiana.6 Before 1901 portrait of Henry and Katherine (Grages) Klemme family. [S193] Church Record, Zion United Lake Co IN Extract, Baptism pg 266. no 33. [S186] Illinois, Illinois Statewide Marriage Index, Vol 2 /Book 59 License 10525. [S245] U.S. Federal Census 1900 U.S. Federal Census, by Ancestry.com, Dwelling 156. ED 101. Name Variation Minnie Wilke was also known as Minnie Glade. Married Name 1 September 1898 As of 1 September 1898,her married name was Klemme. Minnie Wilke was born on 23 December 1876 at Illinois. Minnie Wilke died on 21 June 1968 at age 91 also reported as 21 July 1968. [S250] U.S. Federal Census 1930 U.S. Federal Census, by Ancestry.com, ED56-41. Dwelling 94. Alice Klemme was born on 11 July 1893. She was the daughter of Christoph Karl Klemme and Maria Emilie Anna Claus. [S193] Church Record, Zion United Lake Co IN Extract, Deaths pg 208. Nickname Friedrich Christoph Albert Gustav Klemme also went by the name of Gus. Name Variation Friedrich Christoph Albert Gustav Klemme was also known as Gustav. Friedrich Christoph Albert Gustav Klemme was born on 21 December 1857 at Crete, Will, Illinois, also reported as 21 Dec 1858 and Indiana. He was buried on 26 May 1926 at Saint Luke Cemetery, Beecher, Will, Illinois. Friedrich Christoph Albert Gustav Klemme was confirmed in 1872 at Zion United Church of Christ, Hanover, Lake, Indiana.6 In Heinrich August Christoph Klemme's will dated 16 August 1898 at Will, Illinois, Friedrich Christoph Albert Gustav Klemme was named as executor. Before 1901 portrait of Henry and Katherine (Grages) Klemme family. He was a salesman of wire automobile in 1910. He was a blacksmith in 1926. [S186] Illinois, Illinois Statewide Marriage Index, license 00010715. [S238] Illinois Death Records, by Illinois, FHL Film Number: 1613364. [S245] U.S. Federal Census 1900 U.S. Federal Census, by Ancestry.com, Year: 1900; Census Place: St John, Lake, Indiana; Roll: 383; Page: 1A; Enumeration District: 41; FHL microfilm: 1240383. [S244] U.S. Federal Census 1910 U.S. Federal Census, by Ancestry.com, Year: 1910; Census Place: Chicago Ward 25, Cook, Illinois; Roll: T624_269; Page: 4A; Enumeration District: 1099; Image: 161; FHL microfilm: 1374282. [S193] Church Record, Zion United Lake Co IN Extract, Pg 254. Married Name 14 May 1894 As of 14 May 1894,her married name was Bremer. 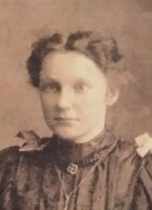 Bertha Klemme was born on 14 October 1872 at Crete, Will, Illinois. She was the daughter of Heinrich August Christoph Klemme and Katharina Grages. Bertha Klemme died on 21 August 1944 at Chicago Heights, Cook, Illinois, at age 71. She was buried on 25 August 1944 at Hanover Prairie Cemetery, Hanover, Lake, Indiana. [S193] Church Record, Zion United Lake Co IN Extract, Baptism pg 353. no 42. [S193] Church Record, Zion United Lake Co IN Extract, Marriages no 108. [S245] U.S. Federal Census 1900 U.S. Federal Census, by Ancestry.com, ED 101. Dwelling 250. [S244] U.S. Federal Census 1910 U.S. Federal Census, by Ancestry.com, Sheet 3B. ED143. Dwelling 39. [S243] U.S. Federal Census 1920 U.S. Federal Census, by Ancestry.com, ED145. Dwelling 118. [S250] U.S. Federal Census 1930 U.S. Federal Census, by Ancestry.com, ED99-2. Dwelling 330. [S193] Church Record, Zion United Lake Co IN Extract, Confirmation pg 259. Name Variation Friedrich Heinrich Bremer was also known as Fred. Name Variation Friedrich Heinrich Bremer was also known as Fritz. Friedrich Heinrich Bremer was born on 11 May 1865 at Crete, Will, Illinois. He was the son of Frederick Bremer Sr. and Sophia Seegers. Friedrich Heinrich Bremer died on 22 December 1948 at Dyer, Lake, Indiana, at age 83. Friedrich Heinrich Bremer lived in 1918 at Crete, Will, Illinois.8 In May 1934 Fred Bremer 69th birthday celebration. [S247] U.S. Federal Census 1870 U.S. Federal Census, by Ancestry.com, Page 37. Dwelling 237. [S246] U.S. Federal Census 1880 U.S. Federal Census, by Ancestry.com, ED190. Page 35. Dwelling 318. Alfred Klemme Bremer was born on 17 March 1895 at Crete, Will, Illinois. He was the son of Friedrich Heinrich Bremer and Bertha Klemme. Alfred Klemme Bremer married Clara Haemker circa 1923. Alfred Klemme Bremer died on 17 October 1960 at age 65. He was buried after 17 October 1960 at Crete, Will, Illinois. [S193] Church Record, Zion United Lake Co IN Extract, Baptism pg 680. No 100. [S250] U.S. Federal Census 1930 U.S. Federal Census, by Ancestry.com, ED99-2. Dwelling 331. George Bremer was born on 16 February 1897 at Illinois. [S193] Church Record, Zion United Lake Co IN Extract, Baptism pg 704. No 103. [S193] Church Record, Zion United Lake Co IN Extract, Deaths pg 234. Name Variation Carl Bremer was also known as Charles. Nickname Carl Bremer also went by the name of Charlie. Carl Bremer was born on 13 September 1898 at Illinois. Carl Bremer married unknown (?) before 1934. Carl Bremer died on 7 November 1959 at age 61. [S193] Church Record, Zion United Lake Co IN Extract, Baptism pg 721. No 106. Name Variation Wilhelmina Glade was also known as Mina. Nickname Wilhelmina Glade also went by the name of Minnie. Wilhelmina Glade was born on 15 June 1865 at Crete, Will, Illinois. She was the daughter of Christian Glade and Katherine (?). Wilhelmina Glade, as the mother of the bride, attended the wedding of Charles Martin Jurgensen and Emma Katherine Klemme on 22 September 1910 at Preston, Plymouth, Iowa; Double marriage of sisters Lydia and Emma Klemme to Herman Schmidt and Charles Jurgensen. Wilhelmina Glade, as the mother of the bride, attended the wedding of Herman Schmidt and Lydia Klemme on 22 September 1910 at Preston, Plymouth, Iowa; Double marriage of sisters Lydia and Emma Klemme to Herman Schmidt and Charles Jurgensen. Wilhelmina Glade died on 14 May 1951 at at home, LeMars, Plymouth, Iowa, at age 85 Mrs. Minnie Klemme, 85, who has been ill for the past month, died Monday at her home at 501 First street southwest in LeMars. She and her late husband, Henry Klemme, were well known early day Preston township residents, having lived on a farm there for 24 years before moving to LeMars 40 years ago. She was born at Crete, Ill., June 15, 1865, the daughter of Mr. And Mrs. Christian Glade. Her marriage to Henry Klemme took place there in January 1886, and they came to Plymouth county shortly thereafter. She was buried on 17 May 1951 at Saint Johns Lutheran Church Cemetery, Ruble, Plymouth, Iowa. 1895 state census, Preston, Plymouth, Iowa Wilhelmina Glade appeared on the census of 1895 in the household of Johan Heinrich Christoph Klemme at state census, Preston, Plymouth, Iowa. 1 January 1925 Le Mars, Plymouth, Iowa Wilhelmina Glade is listed as wife on the census of 1 January 1925 in the household of Johan Heinrich Christoph Klemme at Le Mars, Plymouth, Iowa. 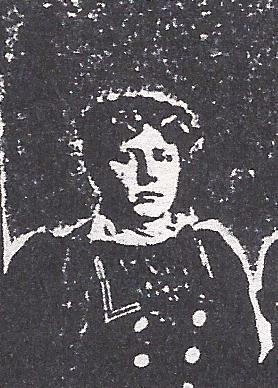 Wilhelmina Glade had eight children. On 6 September 1918 at LeMars Sentinel Mr. and Mrs. Klemme, of LeMars, visited their daughter, Mrs. Will Jurgenson Thursday. [S193] Church Record, Zion United Lake Co IN Extract, Marriages no 79. [S271] Historical Newspaper Collection, Lemars Semi Weekly Sentinel (Le Mars, Iowa) 1951 May 15. [S247] U.S. Federal Census 1870 U.S. Federal Census, by Ancestry.com, Page 30. Dwelling 195. [S246] U.S. Federal Census 1880 U.S. Federal Census, by Ancestry.com, ED190. Dwelling 297. Family History Library Film 1254260. Sheet 36D. [S245] U.S. Federal Census 1900 U.S. Federal Census, by Ancestry.com, Pg 7490. Stamp 113A. ED 105. Dwelling 210. [S244] U.S. Federal Census 1910 U.S. Federal Census, by Ancestry.com, ED 109. Page 8981. Sheet 13B. Dwelling 92. [S243] U.S. Federal Census 1920 U.S. Federal Census, by Ancestry.com, ED123. Sheet 15B. Dwelling 386. [S250] U.S. Federal Census 1930 U.S. Federal Census, by Ancestry.com, ED75-18. Dwelling 4. Name Variation Elisabeth Wilhelmina Sophie Lina Klemme was also known as Emma. Elisabeth Wilhelmina Sophie Lina Klemme was born on 18 April 1862 at Crete, Will, Illinois. Elisabeth Wilhelmina Sophie Lina Klemme witnessed the marriage of William F. Hinrichs and Myrtle Louella Klemme on 21 February 1909 at German Lutheran Church, Sollit, Illinois; Myrtle Klemme and William Hinrichs wedding announcement. Elisabeth Wilhelmina Sophie Lina Klemme, as the mother of the groom, attended the wedding of Edna Luecke and Albert Boehner in January 1917 at Cook, Illinois; Edna Luecke and Albert Boehner marriage announcement. Elisabeth Wilhelmina Sophie Lina Klemme died on 22 March 1949 at Illinois at age 86 Emma (Klemme) Boehner obituary. 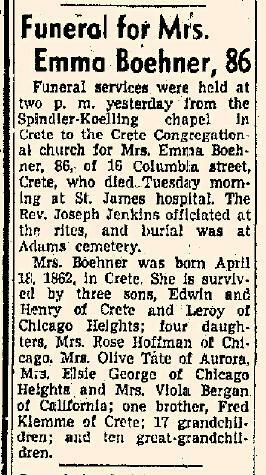 She was buried on 24 March 1949 at Adams Cemetery, Crete, Will, Illinois, Emma (Klemme) Boehner funeral announcement. Elisabeth Wilhelmina Sophie Lina Klemme was confirmed in 1876 at Zion United Church of Christ, Hanover, Lake, Indiana.9 In May 1907 at Bonfield, Kankakee, Illinois, Sophie Klemme visiting ill sister (Dorothy Freise) with daughter Emma Boehner. In November 1909 at Crete, Will, Illinois, attended Emil and Elisabeth (Klemme) Boehner 25th wedding anniversary celebration. She had 8 with 8 living in 1910 children. [S193] Church Record, Zion United Lake Co IN Extract, Marriages no 72. [S193] Church Record, Zion United Lake Co IN Extract, Baptism pg 73. No 8. [S186] Illinois, Illinois Statewide Marriage Index, license 10559. [S245] U.S. Federal Census 1900 U.S. Federal Census, by Ancestry.com, ED101. Dwelling 321. [S244] U.S. Federal Census 1910 U.S. Federal Census, by Ancestry.com, Year: 1910; Census Place: Crete, Will, Illinois; Roll: T624_333; Page: 15B; Enumeration District: 144; Image: 598. [S243] U.S. Federal Census 1920 U.S. Federal Census, by Ancestry.com, ED146. Stamp 28. Dwelling 186. [S250] U.S. Federal Census 1930 U.S. Federal Census, by Ancestry.com, ED99-2. Dwelling 289. [S193] Church Record, Zion United Lake Co IN Extract, Confirmation pg 256. Emil Boehner was born in February 1857 at Bavaria, Germany. 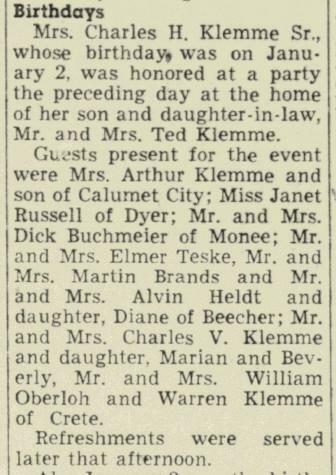 Emil Boehner witnessed the marriage of William F. Hinrichs and Myrtle Louella Klemme on 21 February 1909 at German Lutheran Church, Sollit, Illinois; Myrtle Klemme and William Hinrichs wedding announcement. 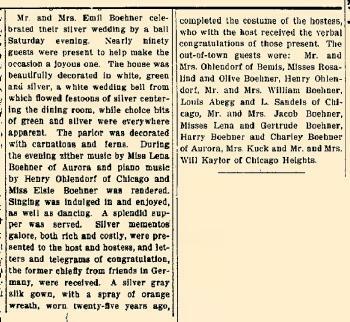 Emil Boehner, as the father of the groom, attended the wedding of Edna Luecke and Albert Boehner in January 1917 at Cook, Illinois; Edna Luecke and Albert Boehner marriage announcement. Emil Boehner died on 3 October 1933 at Crete, Will, Illinois, at age 76. Emil Boehner immigrated in 1882. In November 1909 at Crete, Will, Illinois, attended Emil and Elisabeth (Klemme) Boehner 25th wedding anniversary celebration. Married Name circa 1923 As of circa 1923,her married name was Bremer. Clara Haemker was born on 22 December 1902. She married Alfred Klemme Bremer, son of Friedrich Heinrich Bremer and Bertha Klemme, circa 1923. Clara Haemker died on 26 May 1996 at age 93. Clara Haemker obtained US Social Security Card at Illinois; Last residence: Crete, Will, Illinois. Married Name circa 1900 As of circa 1900,her married name was Frerichs. Ida Klemme was born on 2 December 1880 at Illinois. She was the daughter of Christian Frederick Klemme and Mina W. Hecht. Ida Klemme married John William Frerichs, son of J. B. Frerichs and Maria Grumm, circa 1900. 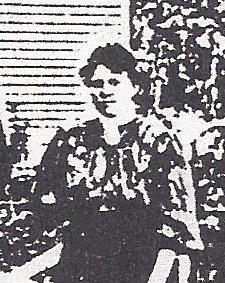 Ida Klemme was buried in 1929 at Ocheyedan Township Cemetery, Ocheyedan, Osceola, Iowa. 1895 state census, Preston, Plymouth, Iowa Ida Klemme appeared on the census of 1895 in the household of Christian Frederick Klemme at state census, Preston, Plymouth, Iowa. Circa 1900 Christian and Minnie Hecht Klemme family photo. Ida Klemme had 2 with 2 living in 1910 children. In August 1914 Mrs Christ Klemme visited with daughters Mrs J W Frerichs and Mrs Gust Jans. In February 1928 Mrs Mina (Hecht) Klemme and son Alex visiting her daughter Mrs Ida Frerichs who is seriously ill.
[S193] Church Record, Zion United Lake Co IN Extract, Baptism pg 499. No 66. [S245] U.S. Federal Census 1900 U.S. Federal Census, by Ancestry.com, ED105. Dwelling 155. [S244] U.S. Federal Census 1910 U.S. Federal Census, by Ancestry.com, ED119. Dwelling 88. [S243] U.S. Federal Census 1920 U.S. Federal Census, by Ancestry.com, ED113. Dwelling 30. Name Variation Friedrich Wilhelm Heinrich Albert Karl Klemme was also known as Charles Albert. Friedrich Wilhelm Heinrich Albert Karl Klemme was born on 7 April 1859 at Illinois. Friedrich Wilhelm Heinrich Albert Karl Klemme married Maria Alwine Elisabeth Klemme, daughter of Carl Frederick Klemme and Dorothea Moeller, after 1889. He was buried after 22 May 1946 at Crete Cemetery, Crete, Will, Illinois. June 1900 Crete, Will, Illinois Friedrich Wilhelm Heinrich Albert Karl Klemme was listed as the head of a family on the 1900 Census at Crete, Will, Illinois. Friedrich Wilhelm Heinrich Albert Karl Klemme lived in 1918 at Crete, Will, Illinois.7 He lived with Frank Clinton Klemme in 1918 at Crete, Will, Illinois.7 In March 1923 Mrs Carrie Behlke of East Chicago spent Sunday at the Charles A. Klemme home. [S193] Church Record, Zion United Lake Co IN Extract, Baptism pg 1. no 1. [S186] Illinois, Illinois Statewide Marriage Index, license 00009006. [S238] Illinois Death Records, by Illinois, certificate 0021548. Name Variation Rev. August Wilhelm Heinrich Friedrich Klemme was also known as Fred. Name Variation Rev. August Wilhelm Heinrich Friedrich Klemme was also known as Frederick H.
Rev. August Wilhelm Heinrich Friedrich Klemme was born on 12 February 1860 at Crete (Endor), Will, Illinois. Rev. August Wilhelm Heinrich Friedrich Klemme married Ida Regina Gerhardina Eilts, daughter of Herre Eilts and Gretje Peters, on 5 May 1883 at Minonk, Woodford, Illinois. He was buried on 24 September 1926 at New Saint Marcus Cemetery, Wilbur Park, St. Louis, Missouri. Before 1901 portrait of Henry and Katherine (Grages) Klemme family. Rev. August Wilhelm Heinrich Friedrich Klemme was a minister in church in 1910. In December 1934 at Baltimore, Maryland, Rev F H Klemme attends 75th anniversary of father's church. His son Huber Klemme also preached at the church. [S193] Church Record, Zion United Lake Co IN Extract, Baptism pg 15. no 2. [S245] U.S. Federal Census 1900 U.S. Federal Census, by Ancestry.com, Year: 1900; Census Place: Freedom, Lafayette, Missouri; Roll: T623_869; Page: 7A; Enumeration District: 155. [S244] U.S. Federal Census 1910 U.S. Federal Census, by Ancestry.com, Year: 1910; Census Place: St Louis Ward 3, Saint Louis City, Missouri; Roll: T624_812; Page: 3A; Enumeration District: 0036; Image: 10; FHL Number: 1374825. [S243] U.S. Federal Census 1920 U.S. Federal Census, by Ancestry.com, ED43. Dwelling 181.